You only need to look at Troy Hunts site and method to hack databases to see how easy and how many people have been effected. This alert is triggered when an active exploit happens against an identified application vulnerability to SQL injection. This means the attacker is trying to inject malicious SQL statements using the vulnerable application code or stored procedures. This alert is triggered when there is a change in the access pattern to SQL server, where someone has logged on to the SQL server from an unusual geographical location. In some cases, the alert detects a legitimate action (a new application or developer maintenance). In other cases, the alert detects a malicious action (former employee, external attacker). 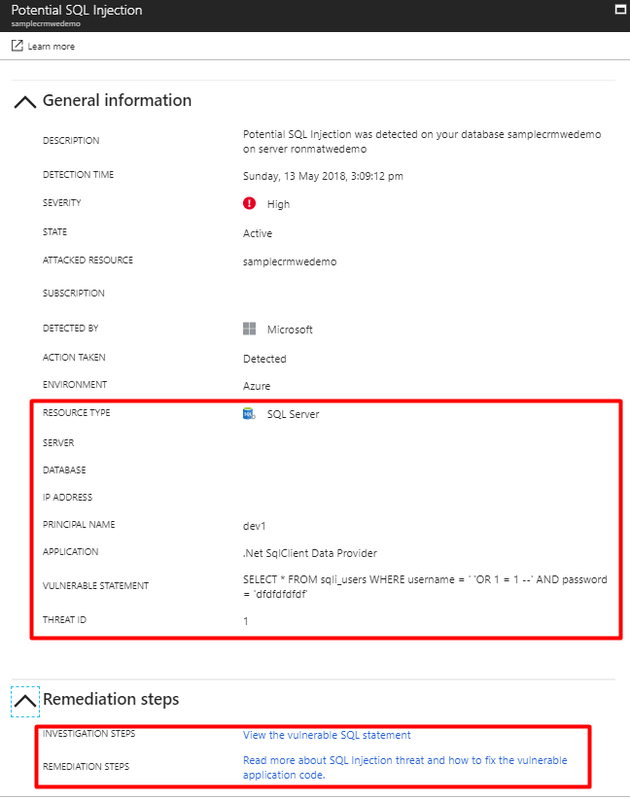 This alert is triggered when there is a change in the access pattern to SQL server, where someone has logged on to the SQL server from an unusual Azure data center that was seen on this server during the recent period. In some cases, the alert detects a legitimate action (your new application in Azure, Power BI, Azure SQL Query Editor). In other cases, the alert detects a malicious action from an Azure resource/service (former employee, external attacker). This alert is triggered when there is a change in the access pattern to SQL server, where someone has logged on to the SQL server using an unusual principal (SQL user). In some cases, the alert detects a legitimate action (new application, developer maintenance). In other cases, the alert detects a malicious action (former employee, external attacker). This alert is triggered when a potentially harmful application is used to access the database. In some cases, the alert detects penetration testing in action. In other cases, the alert detects an attack using common attack tools. This alert is triggered when there is an abnormal high number of failed logins with different credentials. In some cases, the alert detects penetration testing in action. In other cases, the alert detects brute force attack.